When tracking bottled wine in cases you may need to break one or more of these cases down into single bottles. Breaking down cases will be quite common if you are preparing a wine club shipment, for example. In vintrace, you use the Inventory – Disassemble function to do this. Important: In order to break a case into bottles you must have a Bill of Materials configured against your case good stock item that has a Single x1 bottle as one of its components. In our example, we will disassemble 2 cases into 24 bottles; our case (x12) stock code is 10NVCHDEMO/750/X12 ; this case stock item contains our single-bottle stock item 10NVCHDEMO/750/X1 in its BoM. For more information on setting up BoMs click here. Do an inventory search and find the correct case stock item; open it and select Disassemble from the Operations menu. Select the Case you want to break down in the Stock item field. Then set the Quantity (in whole cases) that you want to disassemble into single bottles. 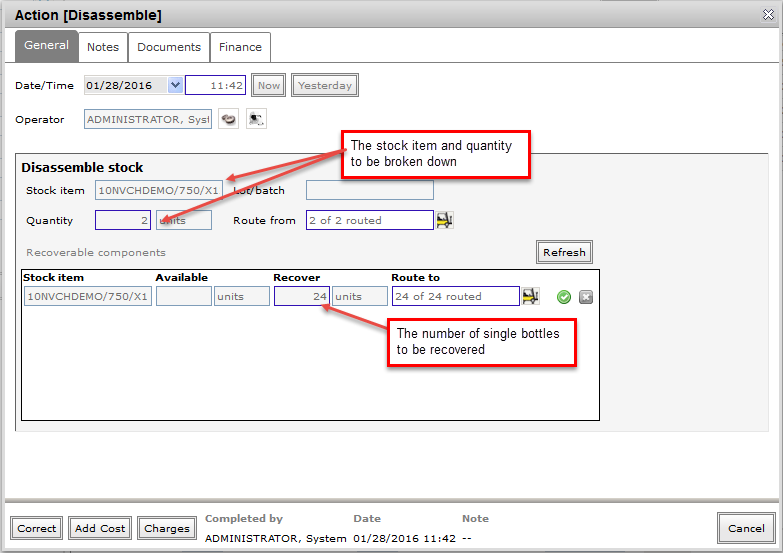 NOTE: set the Recovery amount for the single bottles in the Recoverable components list. Everything left at 0 will be written off, i.e., the divider, box etc. Set the Route from (for the case you are breaking) and Route to (for the bottles you are recovering). This tells the system where to draw down the stock and then where to store it, respectively. After saving the dissemble operation, the net result is you will have fewer cases times the Quantity broken down and more bottles times the Recover amount entered. Here’s what the history for both case and single bottle stock items look like after the disassemble operation. You can then work with the single bottles in order to dispatch or manufacture into other stock items.